Complex Regional Pain Syndrome / RSD is often challenged by disability insurance companies. How Can Disability Insurance Attorneys Dell & Schaefer Assist You? As disability insurance attorneys, Dell & Schaefer have represented numerous long term disability claimants that have been unable to work as a result of suffering from complex regional pain syndrome (CRPS), also known as RSD (reflex sympathetic pain syndrome). Disability Attorneys Dell & Schaefer have an expansive understanding of the significant restrictions and limitations that a person with CRPS / RSD must live with on a daily basis. We have worked closely with top physicians in order to sufficiently satisfy a disability carrier’s threshold of evidence necessary to prove that a client is disabled by CRPS / RSD. Not everyone suffering with CRPS / RSD qualifies for long-term disability benefits, therefore the medicals records of each client must be reviewed to determine the level of restrictions. We welcome the opportunity to discuss your long-term disability claim. You can contact us for a free initial consultation. What is Complex Regional Pain Syndrome (CRPS) / Reflex sympathetic pain syndrome (RSD)? 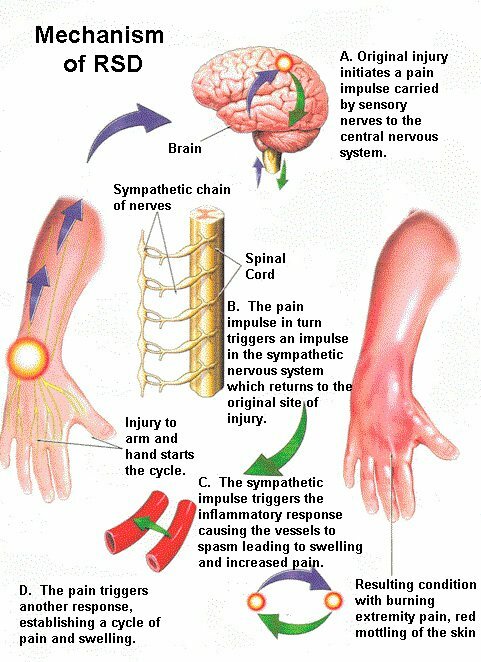 Complex regional pain syndrome (CRPS), formerly known as RSD (Reflex sympathetic pain syndrome) and also known as causalgia, is a chronic pain condition that is believed to be the result of dysfunction in the central or peripheral nervous systems and often follows an injury. RSD/CRPS is a multi-symptom, multi-system, syndrome usually affecting one or more extremities, but may affect virtually any part of the body. Although it was clearly described 125 years ago by Drs. Mitchell, Moorehouse and Keen, RSD/CRPS remains poorly understood and is often unrecognized. The best way to describe RSD/CRPS is in terms of an injury to a nerve or soft tissue (e.g. broken bone) that does not follow the normal healing path. The development of RSD/CRPS does not appear to depend on the magnitude of the injury (e.g. a sliver in the finger can trigger the disease). In fact, the injury may be so slight that the patient may not recall ever having received an injury. For reasons we do not understand, the sympathetic nervous system seems to assume an abnormal function after an injury. There is no single laboratory test to diagnose RSD/CRPS. Therefore, the physician must assess and document both subjective complaints (medical history) and, if present, objective findings (physical examination), in order to support the diagnosis. There is a natural tendency to rush to the diagnosis of RSD/CRPS with minimal objective findings because early diagnosis is critical. If undiagnosed and untreated, RSD/CRPS can spread to all extremities, making the rehabilitation process a much more difficult one. If diagnosed early, physicians can use mobilization of the affected extremity (physical therapy) and sympathetic nerve blocks to cure or mitigate the disease. If untreated, RSD/CRPS can become extremely expensive due to permanent deformities and chronic pain. Type 1 – Previously known as reflex sympathetic dystrophy syndrome, this type occurs after an illness or injury that didn’t directly damage the nerves in your affected limb. About 90 percent of people with complex regional pain syndrome have type 1. Type 2 – Once referred to as causalgia, this type follows a distinct nerve injury. Many cases of complex regional pain syndrome occur after a forceful trauma to an arm or a leg. Other traumas such as surgery, heart attacks, infections, fractures and even sprained ankles also can lead to complex regional pain syndrome. Doctors aren’t sure what causes complex regional pain syndrome and it can be a difficult diagnosis as it is chronic condition. In some cases the sympathetic nervous system plays an important role in sustaining the pain. The most recent theories suggest that pain receptors in the affected part of the body become responsive to a family of nervous system messengers known as catecholamines. Another premise is that post-injury complex regional pain syndrome is caused by a triggering of the immune response, which leads to the characteristic inflammatory symptoms of redness, warmth, and swelling in the affected area. Complex regional pain syndrome may therefore be caused by a disruption of the body’s healing process. In all likelihood, complex regional pain syndrome does not have one single cause, but is rather the result of multiple causes that produce similar symptoms. If complex regional pain syndrome isn’t diagnosed and treated at an early stage, the disease may progress to more disabling signs and symptoms such as atrophy and contracture. Continuity type – The symptoms may migrate from the initial site of the pain, for example, from your hand to your shoulder. Mirror-image type – The symptoms may spread from one limb to the opposite limb. Independent type – Sometimes, the symptoms may leap to a distant part of your body. Physical therapy: A gradually increasing physical therapy to keep the affected limb moving may help restore some range of motion and function. Psychotherapy: Complex regional pain syndrome often has intense psychological effects on people. A person may suffer severe depression, anxiety, or in some cases post-traumatic stress disorder. These conditions can heighten the individual’s perception of pain and make rehabilitation difficult. Sympathetic nerve block: There are two techniques used to alleviate the pain of CRPS in patients. One technique involves intravenous administration of phentolamine, which is a drug that blocks sympathetic receptors. Another technique involves placement of an anesthetic next to the spine to directly block the sympathetic nerves. Medications: Various medications are used to treat complex regional pain syndrome, including a topical analgesic, antiseizure drugs, antidepressants, corticosteroids and in some cases opioids. Spinal cord stimulation: The placement of stimulating electrodes next to the spinal cord appears to help many patients with their pain. Intrathecal drug pumps: These devices administer drugs directly to the spinal fluid, so that opioids and local anesthetic agents can be delivered to pain-signaling targets in the spinal cord at lower doses than medications received orally. This technique often has decreased side effects and increases the drugs effectiveness. Surgical sympathectomy: The use of controversial procedure is a technique that destroys the nerves involved in CRPS. Some experts think it is unnecessary and can actually worsen the symptoms of CRPS, while others report a positive outcome using this procedure. A good source of information about RSD / CRPS. We have published 11 articles about RSD / Complex Regional Pain Syndromedisability cases. Here are the most recent ones.